These days, technology enables us to do some incredible things. I love being able to stay in touch with my family and distant friends by using Skype or FaceTime. These virtual visits allow us to see each other’s faces and body language during a conversation, and it’s been exciting to be able to show things to my parents like my rambunctious new kitten or my blossoming tomato plants during the summer. Health care has always lived at the cutting edge of technology, so it’s no surprise to see some of these technological feats introduced into patient visits and colleague consultations. 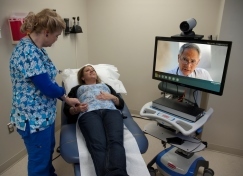 Telehealth has been a hot topic lately, and it is easy to grasp how it would be a boon to communities that struggle with access because of their geographic isolation or health care workforce shortages. CCMU supported recent legislation related to this, HB 1029, which would allow telehealth services to be more reimbursable in our state than they had been before, so more patients can benefit. Removing some of the reimbursement barriers lays the groundwork for telehealth to be further developed in Colorado. Additionally, there are a few exciting projects we have our eyes on: Project ECHO, an educational network to improve providers’ capabilities to care for certain patients, and eConsult, a connection between medical colleagues to consult on patients. There is great potential in telehealth for increased access to care, but there are many other opportunities for it to improve the health care system, as well. In order to take full advantage of it, we will need to be strategic and conscientious in our deployment of it. It’s possible for telehealth to have a substantial effect on patient health outcomes if we can work to ensure patient safety, provider education, and patient-provider comfort both with the technology and in which cases it should be used. Additionally, medically underserved populations could particularly benefit from increased access to care via telehealth. Many who do not have a usual source of care, struggle to get time off from work, or don’t have stable transportation to get to appointments could gain the most from telehealth interventions, if they are widely adopted. It would be wise for us to think about unconventional access points for the technology, such as libraries or community centers, so we can meet Coloradans where they are. We will also need to consider literacy barriers—both technological and linguistic—that limit access to telehealth services, as well as technological barriers, such as broadband access. We can have a significant impact on health disparities and unequal access to care in our state if we are smart in how we deploy our tools. We’re glad that HB 1029 has passed through the legislature with bipartisan support and is on its way to the governor’s desk, because the early results of telehealth interventions are promising. As we scale them up, it’s important to keep the patient’s needs in mind while thoughtfully addressing issues of cost, privacy, functionality, and more. Just as technology allows me to forge and maintain close relationships with friends and family from afar, we can now seize a real opportunity to integrate technology into the patient-provider relationship in a way that makes care more accessible and more in-tune with patients’ needs.